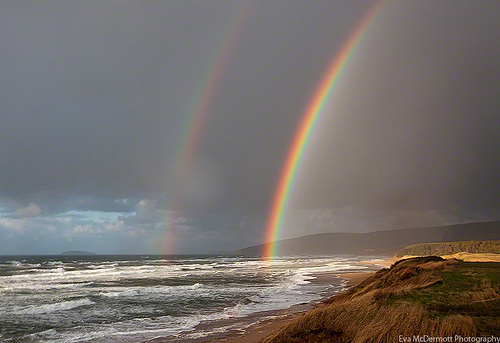 "Inverness Rainbow" by Eva McDermott of Eva McDermott Photography, Nova Scotia. Image from Tumblr link. Red : Reminds me of beautiful flowers- poppies, tulips, hibiscus. And candy! I remember a cherry flavoured old-fashined lolly pop I used to buy at the Circle Smoke Shop in Kapuskasing when I was a kid. It tasted so good. I wish I could find them again but I think they were home-made. Red was the colour of the sun back in 1995 when I tree-planted in northern Ontario. A heatwave made temperatures soar to nearly 47 degrees Celsius and forest fires were everywhere. The heat turned the sun red that summer. Orange : My favorite winter treat is Maroc Star clementines, so juicy and sweet. A deep shade of orange is Burnt Umber, a golden shade of amber brown, the colour of my late dog Cozmo's eyes. They were so sparkly and bright and seemed to carry the miracle of life in them when he looked at me. Orange is wise and warm. The colour of the setting sun. The crackling comfort of a campfire in the summer, or sipping a glass of Port while sitting next to the fireplace on a cold winter's night. Yellow : Bananas and pineapples and lemons, some of my favourite fruits. Homemade lemonade on a summer day is so thirst-quenching and refreshing. I think I could live off these 3 fruits! Mom made the best Lemon Meringue Pie, and my mother-in-law makes the best Lemon Genoise cake. My mom's favourite flowers are daffodils, and I remember them growing in my Grandma Lehtisaari's garden. Sunflowers are one of my favourite flowers. Yellow also reminds me of the centers of Daisies, full of pollen for the bees to make delicious golden honey with. The Sun is yellow and the giver of life and happiness on Earth. The Moon is soft and calming, controlling our tides and cycles. Green : I think of fresh earthy smells like moss and the sweet scent of Spring and fresh cut grass. Green makes me think of life. I remember my childhood where I spent summers in the forest around my home imagining little miniature villages of faeries and Smurfs living under leaves and mushrooms. Green is the first growth in Spring, and the colour of Spring Peepers (frogs). It's the colour of water as light shines through the crest of a peeling wave. Blue : The smell of fresh salty-sweet ocean air fills my senses, and the calming sounds and images of gentle waves and crashing surf fill my mind. Together with green and yellow, water is also a life-giving element, the colour of our Earth, the "Blue Marble". Turquoise is my favourite colour. I look at it and it makes me happy. I love how it pops next to orange and red! It reminds me of vintage surf posters. Indigo/Purple : Midnight is indigo, lit up by the stars and moon. It's the colour of amazing sunsets and sunrises, spring Crocus flowers, and the deepest depths of the ocean. I once met a woman with one eye indigo and one eye brown. It was beautiful and haunting at the same time. My old Japanese Fighter fish from when I was a little kid was indigo and purple. He was mean and ate all my goldfish. Violet/Pink : Red Violet oil paint is one of my favourites to work with, especially when I mix it with yellow, or pair it with orange and turquoise. Pink is the uniform of choice for all my 4 nieces. An outfit without pink is one not worth wearing. Pink reminds me of Bubblicious bubble gum, rosy cheeks from a day playing in the snow, and rosy skin from a day in the sun. Pink is the colour of health. What do these colours mean to you? I would love to know! 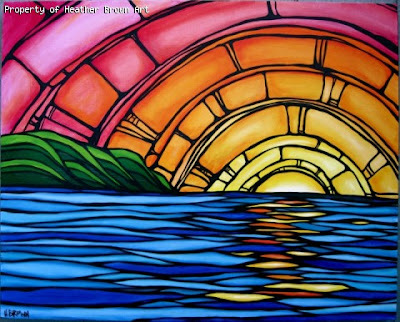 Heather Brown's "Juicy Sunset" matted print, available on her website www.heatherbrownart.com Here. These colours also remind me of the kid's song "How We Love to See a Rainbow", written by Suzy Gazlay. I had never heard this song before until 2 weeks ago when my 5-year old niece Ellie sang it to me. I thought it was beautiful. Made when sunlight shines on raindrops: Here's a rainbow just for you! Green -- the middle one, we know. Violet, the bottom colour: There's a rainbow just for you! 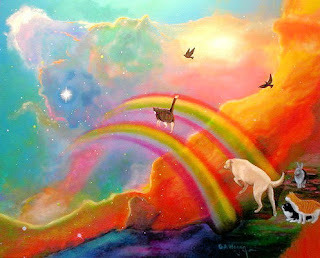 And then just yesterday I was sent the poem Rainbow Bridge by some friends to help me through my dog's recent passing. It is such a heart-warming poem, full of hope and peace, in memory of our beloved pets.